”Miso dzuke” is a classic Japanese Washoku dish, which frequently seen in Bento. It has a savory and a strong flavor, it goes well with rice and still tastes good if you eat at room temperature. This is my 100th video, thank you for all of you watching my channel. As I said in the previous video, I have some give away as my appreciation. I will talk about it at the end! 1. Wash and clean your Spanish mackerel. Pat dry. Cut into two, and shave off the bones. Sprinkle salt all over the surface, and place them onto a rack. Set cover with a piece of plastic, and leave it in the fridge for 10 to 15 minutes. 2. Meanwhile, let’s prepare the miso marinade. Put your white miso into a bowl, add in mirin and mix to combine. In an old school recipe, there are more ingredients to make miso marinade, but I found that the simple ingredient can make good miso marinade. The amino acid in miso and fish will create complex Umami while marinating. 3.Place 4 pieces of plastic wrap on your working surface. Put 2 teaspoons of miso mixture, and place your salted fish, wiping off the excess moisture on top. The salt draws out excess moisture and unwanting fishy smell at the same time. Put some more miso mixture over the fish, and wrap it up tightly. Marinate overnight or up to a week. In a traditional way of making Miso dzuke, we make a lot of miso marinade in an airtight container. Bury the fish and marinate. You can shorten marinating time but, I don’t want to waste my miso in the making process. The idea behind my method is no food loss in the kitchen. You can also make Pork miso dzuke, and Chicken miso dzuke. I am using regular miso, or red miso for Pork and Chicken. Red miso is saltier and it creates good flavor with meat. It takes at least 24 hours to marinate. You can marinate it up to a week or you can freeze it. In that case, thaw it in a fridge overnight. 5. Alright, let’s cook the miso dzuke. After a day or two, the fish should look like this. The flesh looks a translucent and firm to touch. Wash under the cold running water because it easy to burn. As I said before, we have fish griller in the Japanese kitchen. Place them on the rack, grill at the lowest possible heat for 5 to 6 minutes for each side. Or until done. Smells so good! Alternatively, you can use frying pan lined with a parchment paper. Do you remember the salted salmon in the bento video? Flip over several times and good to go! Cut into bite size pieces, transfer to a dish. There you have Miso dzuke! Serve with simple salad and rice. The fish is fluffy and tastes terrific! I recommend to those who don’t like raw fish. 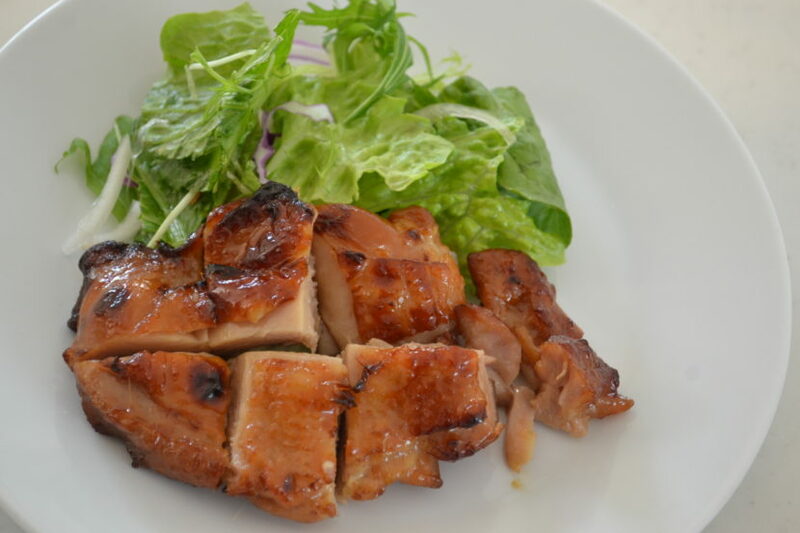 Chicken and pork are rich in savory Umami. You can eat a whole bowl of rice per a piece! Give it a try and let me know how you like it! Now it’s the time to make announce for give away! These are my favorites, in my kitchen. My egg folk and egg bowl, actually it’s just a measuring cup.Lol. Bonito flakes, dried shiitake mushroom, komb kelp, these are for dashi. Instant dashi powder, which contains no MSG. And Mirin. I will pack all of them in one package and send to 1 person! Let me know if you want to resister in the comment, and I will let you know personally. Who is going to recieve?